Obesity can lower vitamin D levels in the body, a study suggests. The report, in the journal PLOS Medicine, analysed genetic data from 21 studies – a total of 42,000 people. It found every 10% rise in body mass index (BMI) – used as an indicator of body fat – led to a 4% drop of available vitamin D in the body. As vitamin D is stored in fatty tissue, the authors suggest the larger storage capacity in obese people may prevent it from circulating in the bloodstream. BMI it is calculated by taking weight (in kilograms) and dividing it by height (in metres) squared. 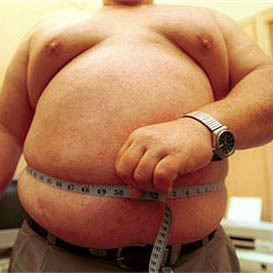 Those with a BMI of 30 or above are considered obese. Lead author Dr Elina Hypponen, from the University College London Institute of Child Health, said the study “highlights the importance of monitoring and treating vitamin D deficiency in people who are overweight or obese”. Vitamin D is made in the skin after sun exposure and can be taken in dietary supplements. Healthy levels are about 50 nanomole per litre – less than 30 nanomole per litre can cause the softening and weakening of bones, leading to rickets in children and osteomalacia in adults.